With my YA reads this year, aside from The Hunger Games I’ve been trying genres that I don’t normally read and as far as possible – indie debut authors. One of the things I like best about the good indie authors I’ve read is that the freedom of publishers and others shaping the book means that the story is exactly what the author wanted to tell and in the way they wanted it. If you look at an author as an artist, then this freedom is a good thing. So…Blue Sky Days…this is a contemporary romance in the main, a genre I don’t often read and so in some ways this was a refreshing change. In many YAs I read, the romance is something that comes along with action and angst and great danger. This book is almost a complete inversion of that model – the ‘action’ and ‘danger’ have significance and grow out of the romantic theme. I’ll not be giving anything away – as the blurb tells you – that after a beautiful initial romance, Nicholas becomes ill – so you can hopefully see what I mean about where the ‘danger’ comes from. In many ways it was good to read a book about real danger…the things that threaten people’s lives every single day, the hardship that people have to endure through serious and terminal illness and how that impacts the relationships they have with those around them. I’d read several reviews prior to reading Blue Sky Days and knew that many readers had found this an emotional book to read – unsurprising given the subject matter – and I certainly found it thought-provoking for the same reasons, not necessarily identifying completely with Emma and her experiences, but her responses and perspective made me consider things in my own life that perhaps you don’t take the time to focus on enough in daily life. Every moment for Emma and Nicholas becomes precious and special, placed under a microscope because of their situation, and their relationships with friends and family are very affectionate and open – despite their difficulties, it is a world many people would want to live in. Emma’s narration is very interesting – it is so personal and open emotionally, that I felt like I were reading her thoughts in a diary. In this way it is unlike other YA books I’ve read – the depth of her self-reflection and knowledge were much greater than others I’ve read, however, this may be more typical of romance genre (and I wouldn’t know!) 🙂 In turn, all of the characters close to Emma are very similar – very emotionally open and articulate their feelings regularly through unguarded dialogue or affectionate gestures. Some readers might find that openness unusual – but as Emma regularly notes, she finds it hard to believe herself, given her past experience with her mother – and for the style of book, it all works together well. Right from the start of the book Emma is on a journey, transitioning from a life of eduction and boundaries to a new world of independence and she draws you into this as though you are absolutely a part of her life, just as Nicholas, Daisy and the other characters do for her. ‘Blue Sky Days’ themselves – as you discover in the story – are these wonderful moments of time and clarity, when you look at the world around you and see what is truly important: the people you care about, the beauty in the world around you and the things that change your life. Blue Sky Days feels like a very personal book. The characters, situation and emotional intensity feel as though they come from real experiences and perhaps this is the case. I rarely read author’s acknowledgements in books, but for this I did and feel that there is a real and important connection between the author and this story, more than most. And this brings me back to the beauty of indie authors – this is Marie Landry’s and Emma’s story, told exactly as it should have been. Overall a lovely book, to be read with the knowledge that you’re delving completely into someone’s life and – just as I read in another review – Blue Sky Days will make you feel. Blurb: A year after graduating from high school, nineteen-year-old Emma Ward feels lost. She has spent most of her life trying to please her frigid, miserable mother – studying hard, getting good grades, avoiding the whole teenage rebellion thing – and now she feels she has no identity beyond that. Because she spent so many years working hard and planning every moment of her life, she doesn’t have any friends, has never had a boyfriend, and basically doesn’t know who she is or what she really wants from life. Working two part-time jobs to save money for college hasn’t helped her make decisions about her future, so she decides it’s time for a change. She leaves home to live with her free-spirited, slightly eccentric Aunt Daisy in a small town that makes Emma feel like she’s stepped back in time. When Emma meets Nicholas Shaw, everything changes – he’s unlike anyone she’s ever met before, the kind of man she didn’t even know existed in the 21st century. Carefree and spirited like Daisy, Nicholas teaches Emma to appreciate life, the beauty around her, and to just let go and live. Between Daisy and Nicholas, Emma feels like she belongs somewhere for the first time in her life, and realizes that you don’t always need a plan – sometimes life steers you where you’re meant to be. Life is wonderful, an endless string of blue sky days, until Nicholas is diagnosed with cancer, and life changes once again for Emma in ways she never thought possible. Now it’s time for her to help Nicholas the way he’s helped her. Emma will have to use her new-found strength, and discover along the way if love really is enough to get you through. This review was also posted at Confessions of a Bookaholic blog. 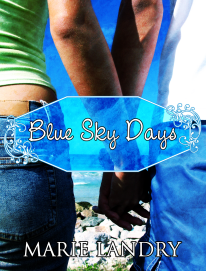 This entry was posted in Reviews and tagged 4*, blue sky days, marie landry, review, ya romance. Bookmark the permalink.